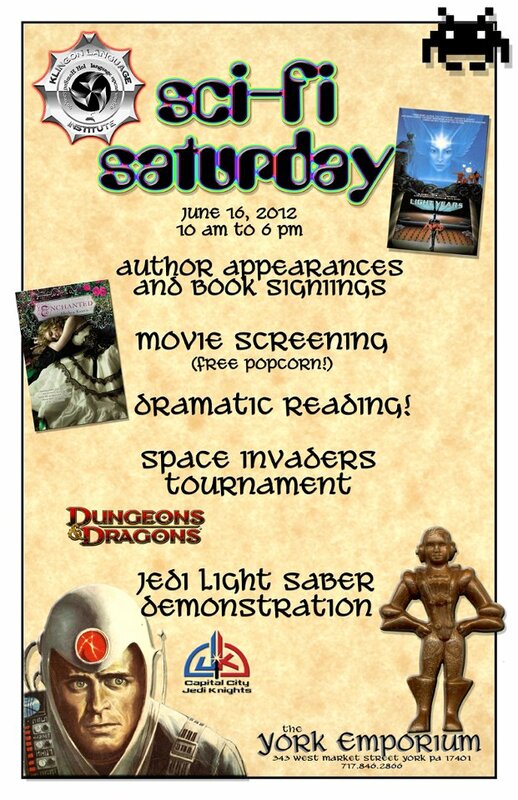 Well, if you live within a 100-mile radius of York, PA, you should be coming to see the esteemed Lawrence Schoen and me at the York Emporium on Sci-Fi Saturday! Much geekery will abound, ALL DAY LONG. Please join us! I hope to have a few copies of ENCHANTED on hand, but as this event is right on the heels of my book tour, I have no idea if I’ll even have any books left. As York Emporium themselves will not be stocking the book, I strongly suggest that if you know you want to get ENCHANTED or ALPHAOOPS (or WONDERLAND ALPHABET!) signed by me, please order it from Amazon (or your local bookstore) in advance and bring it to the event. This entry was written by Princess Alethea and posted on June 14, 2012 at 7:00 am and filed under appearances. Bookmark the permalink. Follow any comments here with the RSS feed for this post.